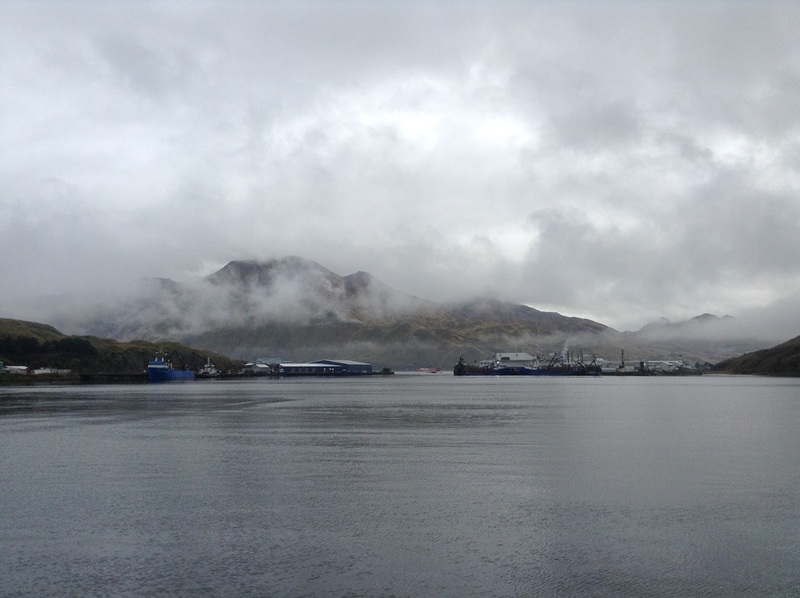 These two pictures are the views from the Museum of the Aleutians looking over Margaret's Bay to the Aleyeska processing plant. One was taken yesterday, one today. I have been watching the boats over there load crab pots for the last week. The pots are stored in lots all over the island. They were picked up by threes on the back of a tow truck and driven to the ship, which loaded them on with a crane. Tomorrow is the beginning of King Crab season. The Original Productions crews, the production company behind Deadliest Catch, arrived last week. The blue boat in this picture is the Fierce Allegiance. It is one of the Deadliest Catch boats. 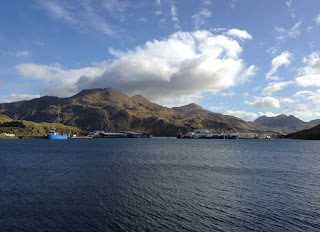 On Wednesday, the crew of the Northwestern was eating at the buffet at the Grant Aleutian hotel when we were in there. The other day I saw one of the Deadliest Catch captains in the Ship Supply. About an hour ago, the crab boats left dock. I think they might be going out to today so they are in the Bearing Sea tomorrow when the the season officially starts. It is an exciting time. It has been very busy here all week, and now today everyone is gone. What a difference a day makes.